You use port rules to create outbound access rules which determine how outbound network traffic and services are managed, that is, whether traffic is blocked or allowed. Note: A Unified Threat Management serial is required to manage outbound traffic. For more information, contact your Smoothwall representative. Allow unrestricted outbound access to the Internet. Allow services common to most user computers, including web browsing (HTTP and HTTPS) and DNS on listed ports. Allow email services on listed ports. Reject all outbound access to the Internet except for listed ports. Reject all peer-to-peer outbound access to the Internet on listed ports. For more information, see Managing Blocked Services . Reject all outbound access to the Internet, except for listed ports and log the rejections. Reject outbound access on the listed ports which are associated with many common exploits against programs and services. Reject outbound access on the listed ports which are associated with Microsoft Windows local area networking. You can create a custom port rule to use. 1. Go to Networking> Outgoing > Ports. 2. Click Add new port rule. • Name — Configure a meaningful name for this rule. Reject outbound access on listed ports, but allow on all other ports. Allow outbound access on listed ports, but reject on all other ports. • Stealth mode — Select to log, but not reject, outbound requests. • Rejection logging — Select to log rejected outbound requests for this rule. 5. 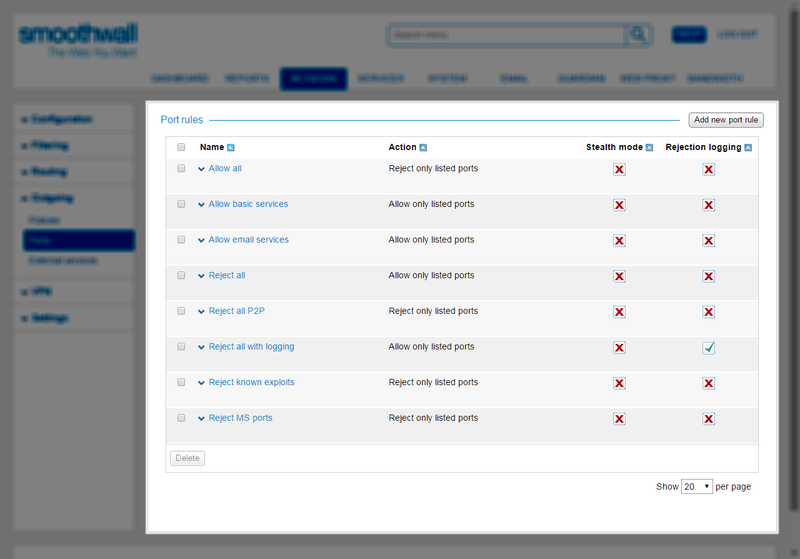 Locate the new rule in the Port rules table, and click the expand arrow to display the Ports table. 6. Click Add new port/service. • Status — New ports are enabled by default. Clear the check box to create a disabled port. • Protocol — From the drop-down list, select the relevant protocol for this rule. • Destination port — Choose to forward traffic to Any port on the external interface, or to a specified one. To route traffic to a specific port, either select it from the most common used ports drop-down list in the middle, or enter it into the box provided at the end. An additional button, Show comments, appears on the Ports table if any comments are configured. Clicking this displays configured comments under the rule. Note: Some services use unpredictable port numbers to evade port-based outbound access rules. For a detailed description of how to control access to these services,see Managing Blocked Services . The Smoothwall is able to detect and block specified service activity, such as Skype and BitTorrent, using Deep Packet Inspection (DPI). Note: The types of services available depend on which DPI licensing you have purchased. For more information, contact your Smoothwall representative. Each predefined and custom port rule comes with a vanilla Blocked services service as standard. 1. Go to Network > Outgoing > Ports. 2. From the Port rules table, locate and highlight the relevant rule. 4. Locate the Blocked services rule, and click Edit. • Services — Select the relevant services for Blocked services. Note that you can select the category name to select all services for that category, rather than selecting each one individually. • Comment — Configure an optional comment for Blocked services.